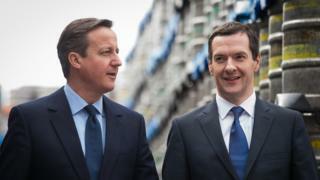 David Cameron and George Osborne have hailed their austerity plan after the former chancellor's deficit reduction target was finally met. The day-to-day deficit has been eliminated two years later than Mr Osborne wanted when he set it in 2010. Mr Osborne tweeted: "We got there in the end - a remarkable national effort." Mr Cameron replied: "It was the right thing to do." Labour accused them of "egotistical boasting" while families suffered. Shadow Chancellor John McDonnell said: "This is truly shameless opportunism by the former chancellor who missed every target he ever set himself and is now trying to rewrite history and distract from his record of failure, while editing a newspaper. "He is also insulting the millions of people in our country who have suffered these last eight years due to this Tory austerity agenda he devised." He added that people "struggling to feed their families" or find a school for their children would "not welcome his egotistical boasting". "Let's also not forget that when George Osborne entered Downing Street he promised to eliminate the deficit by 2015, and failed to deliver on his central economic goal. "Now his successor and Cabinet colleague Philip Hammond still cannot achieve this, yet continues with the same failed economic policy." Labour MP Yvette Cooper tweeted: "My God, the damage these two have done and not a flicker of self doubt." The UK is now running a surplus of £3.8bn in its current budget - the money borrowed to fund day-to-day spending rather than long-term investment - according to the Office for National Statistics figures. Paul Johnson, of the Institute for Fiscal Studies think tank, told the Financial Times it was "quite an achievement given how poor economic growth has been". He added: "They have stuck at it but deficit reduction has come at the cost of an unprecedented squeeze in public spending." A Treasury spokesman said: "We are making a success of reducing the deficit, which is down by more than three-quarters since 2010. "But our national debt is still too high, and we must get debt falling to improve our economic resilience and reduce the burden on future generations."